Additional singing and dancing groups will make this year’s Cherry Hill Education Foundation fundraiser the biggest yet. Members of the One World Dancers show off what schools they represent for a picture following a rehearsal. 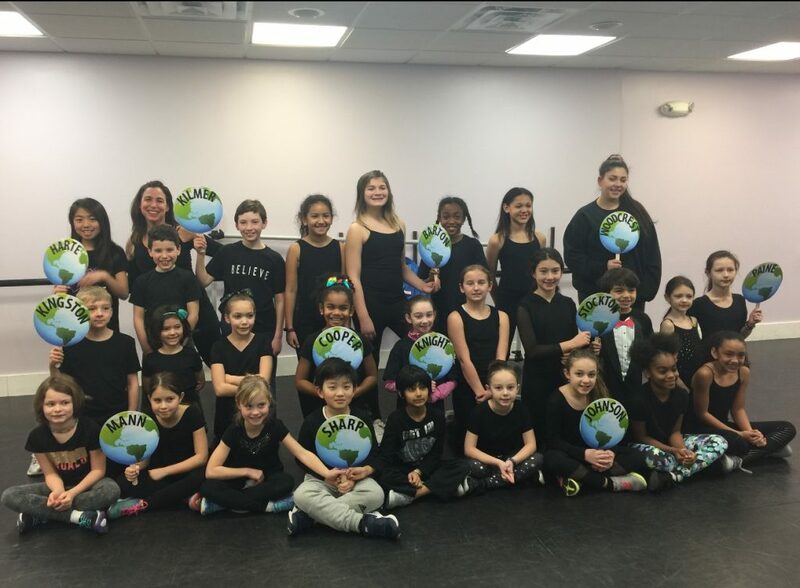 The dance group, which consists of students from all 12 Cherry Hill elementary schools, will perform at the 2019 Dancing with the Cherry Hill Stars. There has never been as many people involved with the Cherry Hill Education Foundation’s Dancing with the Cherry Hill Stars show as there are this year. One of the new additions to the show is a chorus of teachers from all 19 schools in the district. The group is called the One World Singers and will perform to open the show. Stofman said the response to the One World Singers was incredible. More than 40 teachers and staff from across the district volunteered to be in the group. After forming the group, Stofman felt students needed to be a part of the show as well. This led to the formation of the One World Dancers, a dancing group open to elementary school students in grades one to five. Stofman said the response to the dancing group was also enormous, with 29 students from all 12 elementary schools in Cherry Hill represented. Not only are students involved with the dance group, but a few young students who are competitive dancers are participating as contestants in this year’s show. Those students include Julie Cohen, a student at Bret Harte Elementary School, Thomas D’Alessandro, a student at Joyce Kilmer Elementary School who is dancing with his mother, Joyce Anna D’Alessandro, Kaelan Faria, a student at Woodcrest Elementary School and Tavit Murray, a student at Thomas Paine Elementary School. Another group added to this year’s show is a lip sync group from Carusi Middle School. Last year, the Cherry Hill Education Association held a lip sync contest with teachers from around the district participating. Stofman served as a judge for the contest and the group from Carusi took first place. Stofman was so impressed, she decided to invite them to be a part of this year’s show. Stofman believes the added entertainment will resonate warmly with Cherry Hill’s diverse community. “The theme just kind of lent itself to expand our audience and to involve more people because of our diversity,” she said. Dancing with the Cherry Hill Stars has had a major positive impact on Cherry Hill schools for more than a decade. The event remains Cherry Hill Education Foundation’s lead fundraiser each year. Since 2007, CHEF has raised more than $1.2 million for the district. The money is used to fund grants to support the school district. Tickets are on sale for Dancing with the Cherry Hill Stars. Tickets for adults are $25, and tickets for students and senior citizens are $15. To purchase tickets and vote for your favorite dancer, visit www.cherryhilleducationfoundation.com.